At 4am on Tuesday, some obnoxious chiming noise woke me with a start. For a minute or so I was completely disoriented: Where am I? Why am I up this early? Whose bed is this? Then it all came in like a jolt: it's Inauguration Day! I leapt out of bed and started getting ready for the big day. So began my inaugural adventures in DC that involved frozen toes, the wonders of evolution, the best cup of cocoa in the world, and dancing with strangers. My friend Tony and his wife Laure were kind enough to host me in the DC area for the inaugural events, which was a great relief to me. 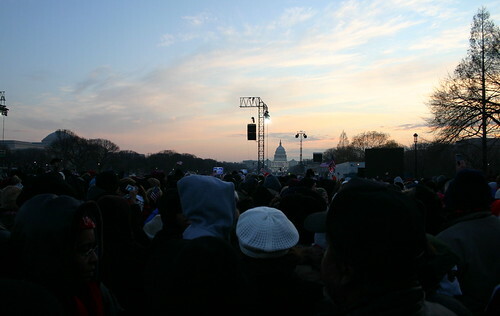 We decided to head into the city as early as we could to try and get a decent spot on the Mall for the inaugural ceremonies — hence the 4am alarm. After working our way to the nearest Metro station, crowding onto a train, and heading into the city, we finally arrived at around 6am at the L'Enfant Plaza stop, not far from the National Mall. Along with tens of thousands of other people with exactly the same plan. Walking the few blocks from L'Enfant Plaza to the Mall was a very strange journey that involved shuffling along with hundreds of others to possible entry points to the Mall, only to get turned around by emergency vehicles or told that this entrance was closed until 8am. Information and rumor passed around from person to person in the crowd as we slowly moved from block to block. Finally near the Air and Space Museum, we found a tiny entrance that led out into the Mall area. It was only 7:30am and about 20 degrees out. The inauguration was not scheduled to begin until 11:30am. We joined a packed crowd clustering around the nearest Jumbotron and began the long wait. I have never been so flipping cold in my entire life. Despite my careful planning and multiple layers, just standing there in the cold doing nothing took its toll over the next couple of hours. It was my feet that felt it first — the cold seeping through my two pair of socks and thin sneakers. I cursed myself for not thinking to get a pair of winter boots. I saw several teenagers wearing canvas Converse sneakers and wondered how they could possibly stand it. My companions Tony and Laure were not faring much better. Finally at about 9am we decided to find someplace to warm up. We started wandering around the Mall area hoping that one of the museums would be open. What was remarkable was how varied the levels of density of the crowd was. In some parts you literally had to fight for every square inch as people stood shoulder to shoulder. In other areas, people had laid out blankets and lawn chairs and were able to move around with ease. If only there were some system of getting the people in the packed areas to spread out — but there was no police or parks department presence to be seen and the Jumbotrons displayed no useful information. After encountering a few closed buildings, we finally fought our way through to the Natural History Museum, which was blessedly open and warm inside. We made our way to the mammals exhibit, where a video about evolution and mammals was playing. We sat in the theater seating for I don't even remember how long just watching the short film over and over again. Did you know that the three characteristics that indicate whether an animal is a mammal are (1) a mother that provides milk, (2) fur on the body and (3) small bones in its ears? Well, now you do. We also found a vendor selling hot chocolate that was the best damn $3 cup of cocoa I have ever tasted in my life. Feeling 1000% better, we decided to brave the cold again once the musical program started up after 10am. 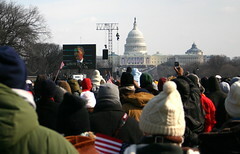 The actual inauguration ceremony was a remarkable experience that made all of the hassles and cold worth it. 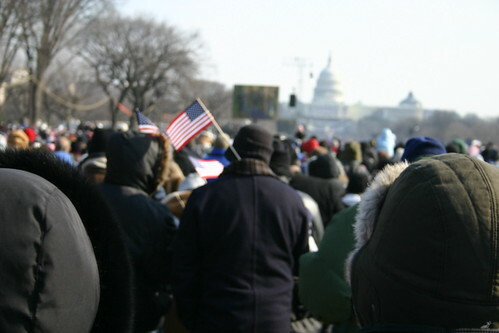 There we were, amidst a crowd of a couple of million Americans (and others) to witness the first African-American getting sworn in as President of the United States. On every face you could see excitement and happiness and wonder. 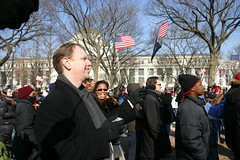 Folks I talked to had come from California, Texas, Chicago, the United Kingdom and the District of Columbia to be here. You had heavily swaddled infants and old folks that could barely walk. It could not have been more American. When Bush was introduced by the announcer, boo'ing filled the air. Then Michelle and kids came into view and we all cheered and gossiped about her outfit. Finally the time came for the swearing in. Two million people held their breaths. Justice Roberts flubbed the words and Barack corrected him and then continued. And then it was over. We cheered until we were hoarse, waved flags like idiots, hugged each other, high-fived, cried, laughed, muttered prayers. We listened intently to Barack's inaugural speech, taking in his sobering words, exhorting us to step forward and take responsibility for our place in the world. It seemed to me like President — President! — Obama was readying us for the fight of our lives, to take back our democracy, rebuild our place in the world, make good on the promise of America to those most disenfranchised. I've listened to it a few times since, and I think it set just the right tone. 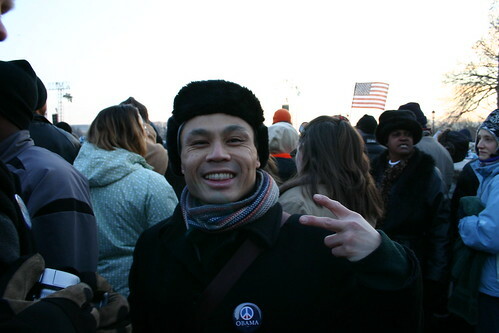 After the inauguration, my friends and I had had enough time in the cold. Others chose to spend several more hours out there to catch the parade, which still astounds me. We headed instead to Eastern Market for warmth and food. That evening, after a bit of rest, I headed back out to go to a swing ball at the Jam Cellar in Columbia Heights. Not a fancy gala affair like the official inaugural balls, some folks had on tuxes and gowns while others wore jeans and tee-shirts. So on inaugural night, I danced the night away with 50 or so other lindy hoppers from around the country, doing this uniquely American artform called Swing, all celebrating in our own way our new President.